Mix and Chic: My son's bedroom (work in progress)! After completing our master bedroom, we decided to turn our focus on our son's room. Our son, Isaac (who just turned six years old yesterday by the way) has been oohing and aahing our master bedroom a lot. He has been saying things like, "I like your new bedroom, mommy, it's so beautiful!". He also likes to hang out in our master bedroom during the day so I know he is ready for his own big boy room. Technically, our home has four rooms, three on the same level (we have a ranch style home) and another room in the basement. My husband decided to use that basement room for storage so we were left with only three rooms. We got the biggest room as the master bedroom because it's the only room with an attached bathroom. The other two rooms were obviously smaller- a medium-sized and a small sized room. I wanted to save the medium room for our son but my husband insisted that he get the smallest room. He wanted to use the medium room as the guest bedroom because it was furthest from the master bedroom and he needs his "privacy" when guests stay over. Now, my lovely readers, if you are in my situation, what would you do? Would you sacrifice your child's comfort for privacy? Or privacy is your top priority? Let me know your thoughts on this, I really wanted to know what the majority of you think. Anyway, our son got the smallest room. When we moved in, the room was painted a lime green (picture shows yellow), has mini blinds and laminate flooring. The room measures at 8' 8"x10' 4" and has only one window. Since I can't do anything about the room size, I decided to make it look brighter and larger using white paint. At first I really wanted to do a feature wall with wood planks. We saved a bunch of planks when my husband ripped our deck earlier but now, he decided not to use them anymore. He wasn't sure if the planks were treated with chemical and didn't want to take any risks. Then, I suggested we install a chair rail to add some architecture feature in the room. After the hardwood floor installation project on our master bedroom, he said he needed to take a long break (which means no big projects for him in a while) so the idea was banned as well. I thought painting a striped wall would be a great way to add interest to the walls. He finally agreed to my third suggestion. Phew! It was not easy selling my ideas to that guy, let me tell you! No wonder they said a couple that decorates together stay together, so true! This bedroom, even though it's small, took me almost three full days to prep, prime and paint. It was a lot of work, which is why I am not a fan of any home renovation or DIY projects at all. For all you home renovators and DIYers out there, you got my utmost respect. My husband helped me with the stripe measurement, though. He is good with maths so I just let him do his thing. The walls were painted and the taping for the stripes were up as well. I have been accumulating accessories and stuff for my son's room for a while now. I can't wait to decorate this room! This is the trundle daybed we bought for Isaac's room recently. I love that it is white yet still gender neutral with some nice details. We have made quite a bit of progress lately so stay tuned for more updated pictures next week! The stripes are the perfect solution for this small room.. I'm looking forward to the after on that. You won't like my opinion...move the guests to the basement. There must be another solution for storage? Attic, garage, toss? Son should get larger room and third small bedroom should become office/storage/whatever. If you think your husband will hate this idea...don't show him my comment. Great post. Your son is smart as a whip since he dropped enough hints to now force ya'll to get his room up to snuff! Never underestimate these kids. Hmmm, you are in a predicament here lady with the hubs. I see his point about wanting to keep the guests far away but the larger room should have definitely gone to your son. A)He's a growing child and will need more room B) You have guests in town a few times a year, so why give them so much real estate? C)If your husband really believes the guests should be farther away, then they should really be in that basement room. Pretty sure you could think up a better storage solution. Remember the guest bedroom rule of thumb: Don't make it too comfortable or too fab, otherwise they'll never leave! I think your son trumps guests. He lives there! He'll have so many toys and things and needs more room. Guests only require a bed, nightstand and closet. Whatever you end up doing, it will look FANTASTIC! 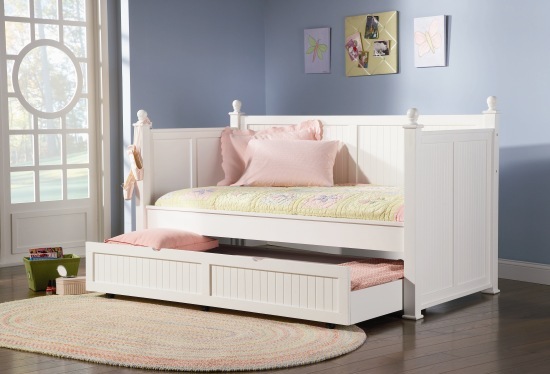 I have been searching for a daybed w/trundle, can you add the link to the source? It's going to be so great. I did a wall of stripes in my son's room and I think it's the perfect boy accent. I would definitely have given my son the larger room. He lives in the house so he's entitled to it. I can't wait to see the progress Jessie! I love his compliments about your bedroom too. That is so sweet! You are doing a great job. The Prep for painting is the worst part! I love the bed! Can't wait to see the "Reveal"! oh can't wait to see how it turns out. Hmm.... what does your son think about the room choice? Some kids like small rooms. and being close to mommy! Meanwhile your DH might want privacy from your son as he gets closer to those teenage years! Hey all the toys and stuff that doesn't fit in his room, as well as homework space, scattered about your living space might convince DH to change the room choice sooner than you think!! Comfort for me first at his age. When he's 12 or something you can consider privacy as motive. Jesse, we only had two extra rooms as well and we had two children - one room was very, very small. That room was first our office then was turned into our nursery when our second child was born. Later, when my oldest was in high school, we switched her to the smaller room because we decided the youngest (who was six years younger than her older sister) needed more room because at her age she still had toys and things to play with. It was basically the size of a dorm room and I figured that at least it would prepare her for college, haha. Then later, when she went off to college, her sister decided she would prefer that room and she switched. It barely fit a bed and a nightstand. We made every use of the closet space and it taught them to be organized. Your son will do just fine in a small room I think.